There are so of that love which never pass. The love of nature is there for me one of them. 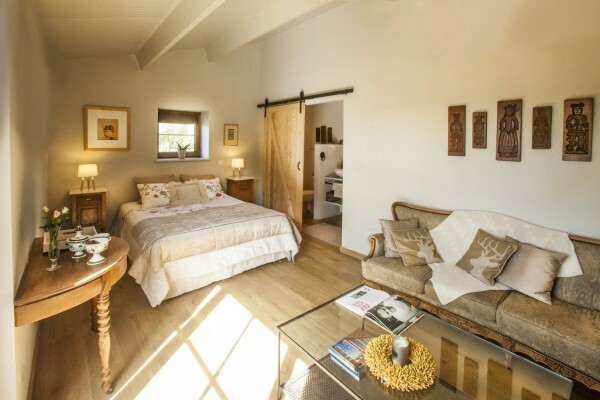 I like to welcome you in my small-scale b&b De Vossenbarm, idyllically situated in the middle of the 500 ha large protected landscape of Vloethemveld, in the rural Snellegem. 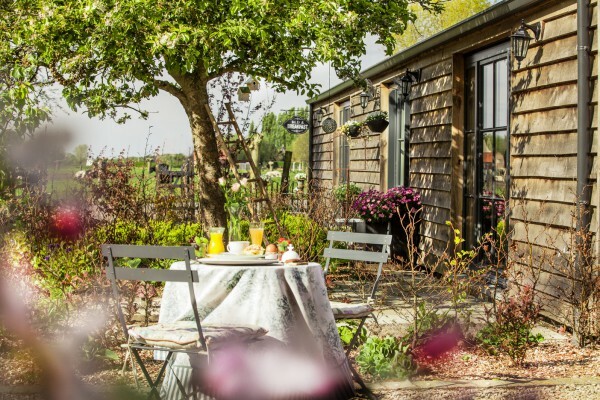 It is the ideal place to unwind and to discover the charm of Flemish countryside and the coast. The Vossenbarm is located on beautiful cycling, walking and equestrian trails. The Vossenbarm is located on a plot of approximately 6 000 m2 amid the meadows and fields. The small, old farm was demolished to make place for an ecologically sound rural dwelling. So we are responsible for our own water purification and we heat everything with a heat pump. We recover rainwater for plumbing and ensure a healthy quality of life in our super insulated house with a ventilation system with heat recovery. We used as much as possible fair materials: oak wood, natural stone and wrought iron. The meadows, the vegetable garden and the Orchard al bloom and grow in all their glory. The rest of the garden is still in full development and is a work of years. However, the greatest asset of the Vossenbarm is its exceptional location amid the protected landscape of Vloethemveld. Here you can listen to the wind in the fields, the vocals of a thrush or simply enjoy the endless views. This place reminds me again and again, to whom I am. Plant your feet into the ground and let loose what gets in your way. Here you can enjoy the art of being silently happy. I hope to welcome you soon as my guests and wish you an unforgettable stay. B&B DeVossenbarm is very easy accessible by car. On the other hand, public transport is limited. Welcome in one of our 5 unique rooms, where you can enjoy complete tranquility, luxury and unique views. All rooms are equipped with a separate bathroom with bath or shower, comfortable beds, table, sitting area, flat screen, free Wi-Fi, coffee, tea and water. Three of the rooms have their own private terrace. 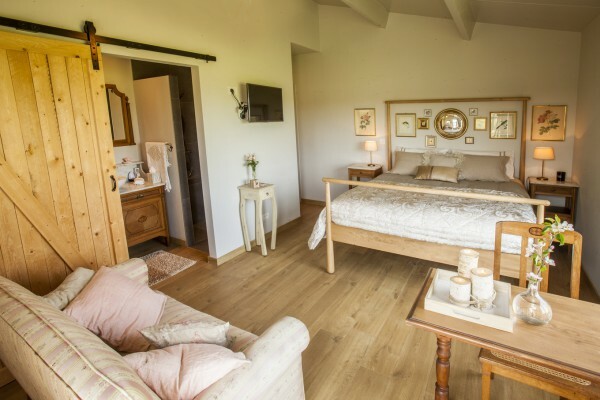 B&B de Vossenbarm features a cozy, common lounge with fireplace, spacious seating area, table, honesty bar, table games. 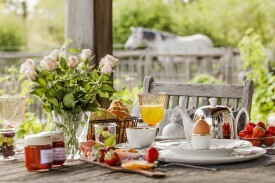 There is also a separate, cosy breakfast room with fireplace and unique views where you will be spoiled with all kinds of fresh, local products. In good weather, you can have breakfast on the large, communal terrace. B&B de Vossenbarm features a private car park and a closed bicycle shed. If possible, all personal wishes will be taken into account. B&B DeVossenbarm is very easy accessible by car. Gift certificates on date, open date or for a certain amount are possible. The gift certificate is then sent to you in an original packaging, ready for giving off. Ask us for our extra conditions for longer stays and our group discounts. I will not accept credit cards or ATM card. A hearty breakfast with local nature products provides you everything you need to start your day. There you can taste fresh farm eggs, among others-a fine selection of charcuterie and cheeses, homemade Marmelades, pressed Apple juice, honey and warm (sandwiches). 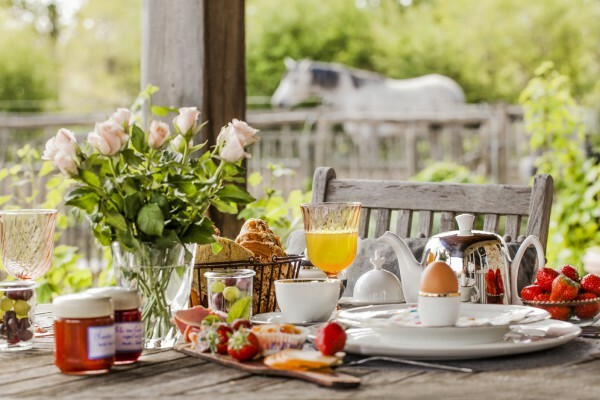 The extensive breakfast is served in the room on request, otherwise in the cosy living room or in good weather on the terrace with views over the expansive fields. I serve breakfast from 8 hours to 10 hours or on another hour after consultation. Coffee, tea and water are permanently available in the room. A nice glass of wine or a romantic bottle of champagne is available on request. I foresee no lunch or supper. You can visit the many restaurants and bistros that the region is rich. private parking for the car and closed bicycle shed. Attention: B&B De Vossenbarm is easily accessible by car but public transit is difficult! Given our numerous dogs and cats we can not permit your pet. Horse and rider, on the other hand, are more than welcome. For the sake of safety should not be smoked in the rooms. Fantastische ligging met een prachtig uitzicht tijdens het ontbijt en zalige rust. Toch ligt het op slechts 5 minuten van de autosnelweg en is het dus een goede uitvalsbasis om niet alleen Brugge, maar ook de kust, Gent of Antwerpen te bezoeken. Christine is ook de perfecte gastvrouw. Ze geniet ervan om haar gasten te verwennen met een heel erg uitgebreid ontbijt (verse smoothies, eitjes gebakken zoals gewenst, 5 soorten brood en immense keuze beleg staren je iedere morgen aan van de grote ontbijttafel). Daarnaast heeft ze ook een steeds aantal tips voor leuke activiteiten in de buurt. Did you stay in B&B De Vossenbarm? Let us know what you thought about it and help others to make the right choice! * I confirm having stayed in B&B De Vossenbarm. Find other bed & breakfasts in Snellegem, all bed & breakfasts in Brugse Ommeland or all bed & breakfasts in West Flanders.